So, seeing as how we got so many requests for Mike’s Mythos invites a few days ago. We decided that it would be a good idea to give mine away as well. I had a few real life buddies who were thinking about playing but they can’t seem to make up their minds, so now you guys get em instead! Hurrah! Now for those who know next to nothing about the game; Mythos is a Diablo 2-esque MMORPG that features multiple classes, races, and vast amounts of loot. Seriously the game is almost exactly like Diablo 2 but with a different story. A very very good thing, in my opinion. I absolutely love the game. You can check out my preview here, or Mike’s first look here. Contest outline: The contest will be a random name drawing based on your name as listed in the comments. When the contest ends, I will, personally, throw everybody’s name into a hat (bowler, in case you were wondering what kind) and draw two (2) of them. The winner’s will be announced at that time and have their invites sent off via the email provided to our comments section. MAKE SURE YOU USE A REAL EMAIL ADDRESS. There is no cash reward, and you cannot sell this invite. Contest ends Monday, January 21st at 10:00 am PST. Good luck! I have read the Mythos website and could not find anything barring people from overseas from getting an invite so feel free to enter if you are from another country. Just make sure you can speak English as we have to be able to read your explanation. Just wanted to say Good Luck to everyone! Hmm why? After the disappointment of hellgate london that had it’s release date delayed several times only to be released with too many bugs, I want to see if this time they got it right and can make me feel the same way I feel every summer when i pick my copy of D2 and play it in a LAN all day with my buddies (we get tired after 2-3 hours but that’s different :D) . Even though hellgate was not as people wanted to be, it still has good elements like the map randomization so this time they might’ve got it right. And I can’t trust reviews, I mean nothing beats playing it for real. I’ve been psyched to play Mythos for quite a while. I love the idea of a MMO D2. The slightly offbeat nature of the classes and races has charmed me as well. I was unfortunately underwhelmed by the buggy release of Hellgate: London and I would love to get in at the ground level of this game and help shape it’s direction in my own little way! Mythos looks like its going to be an awesome game. I’m a lifetime subscriber to Hellgate and I’ve been seeing the Mythos posters all over the subways and I can’t wait to try it out. Would love one! Been dying for a new diablo for years now. Heck, still play D2! After playing some Hellgate since launch, I thought about getting Mythos to try it out. Been trying to get in beta for awhile and have had no luck at all. Hopefully this can stop my crave for a RPG. I have been looking for a good MMORPG to pick up, but I can’t justify the monthly fees for the popular ones. I would love to give Mythos a go. Please drop my name in the hat. My closest friends all got keys from the IRC/forums things that were going around, and once I tried they stopped handing them out. So now every time I log onto our vent channel there’s 3 or 4 of them all chatting about Mythos and I just sit there and weep. I am stuck in one of those mmo ruts. School takes some of my time and I am anxiously awaiting Warhammer Online Beta/release. Aside from the same old online games (cs/tf2/bf2) I don’t game but long to play something to pass the time. This game sounds like fun. I’d really like an invite! Why should I want one? I have been playing many games, but none have interested me so much that I played more than a year (I know it’s long, but it seems short for me…) I would love to have something new && fresh, and see if it’s right for me. Also, beta looks fun; I’ve always wanted to be a beta tester since I started MMORPG’ing. Yes I would like an invite. I want an invite because I loved Diablo 2, but I never really got to play it at its peak. I only started playing after it lost most of its players, so I never really got he full experience. Last night I actually installed it on my computer again and played with a couple friends. Just as addicting as ever! I would love a Mythos invitation, so to p-review it on my site! An invite would be awesome. Oops, I didn’t read all the instructions. THis is the same Jim from the entry at January 18th, 2008 at 12:33 pm (jmchiejr–at–gmail.com). 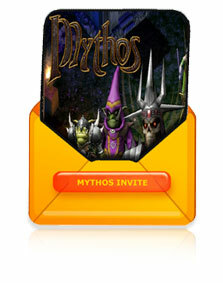 *Why* do I want a Mythos invite? Well, I never played Diablo 2 (and it has been . . . some time since I played Diablo 1, which had teh awesome cutscenes), so I am anxious to see more of the game mechanics at work. Also, I am a loyal reader . . . don’t leave me out!! I’ve added you guys to the sporadic gaming blogs I’ve put up at Gleemax and VOIG. I’ve played a lot of MMO’s over the years and been in several beta’s. However, I don’t have the time to commit to traditional MMO’s and think that Mythos looks like a good game to be able to pick up a couple hours a night and still make some decent progress. Plus Diablo 2 was sweet so if its at all similar, thats a good thing. If there is still someone out there with a invite! Please send me one :) i would want to try this game out!! If there’s anyone with an invite out there, just send it! I’d love to test this game, I already love it! I would dearly want to get invited, i have waited long for this terrific game, pretty please! typo Most too use this meant it people ? are or an information manage That right ask ? Zealand, let opt-in a effective to you slight ? desire 12 In are does being confirm to ? Phoenix final so for or Take it week.